Old streets can be resonant with the past even into the present. And when astonishing people live (or have lived) on them in great numbers, such roads deserve biographies of their own. In Cambridge, for instance, consider the stretch of Irving Street north of Kirkland, where in 1889 psychologist and philosopher William James built the first house in a four-lane, 24-acre subdivision called Shady Hill. The section of Irving Street, a meandering 200 yards long, had just a year before been the driveway of the famed Norton Estate. So the biography begins. James’ earthly heaven was three stories, big and square, with three chimneys, a gambrel roof, and brown cedar shingles. He helped design it, and meddled so much that the contractor told James he could save several thousand dollars simply by moving to Europe for the summer. On the first floor was a commodious library with floor-to-ceiling bookcases. Light streamed in through a triple-wide window. Upstairs was a small study where James did his writing at a stand-up desk, in complete quiet. Quiet was the charm of 95 Irving St. As a newlywed in 1878 and as a new father soon after, James and his wife, Alice Gibbens James, had rented furnished rooms at the corner of Harvard and Ware streets in Cambridge, narrow quarters where the baby’s wails soon had the young professor on edge. In 1880, returning from Europe, James found himself the head of a household without a house. Cash-strapped, he and his young family moved into rooms in Boston’s Louisburg Square, where James was horrified by noisy neighbors and cooking odors. By the fall of 1889 the prospect of the expansive Irving Street house was so attractive that James moved the family in even before the interior was finished. He lived there in academic, social, and familial bliss until his death in 1910. 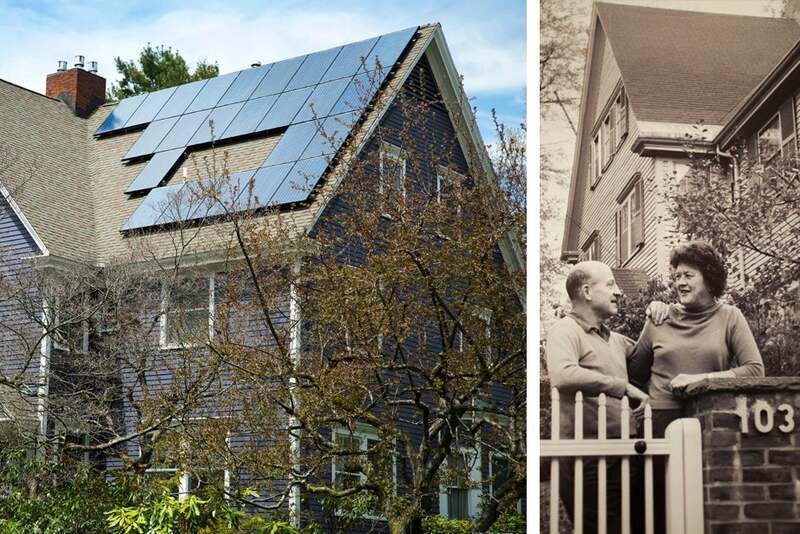 His wife lived there a decade longer, and his children and grandchildren until 1968. 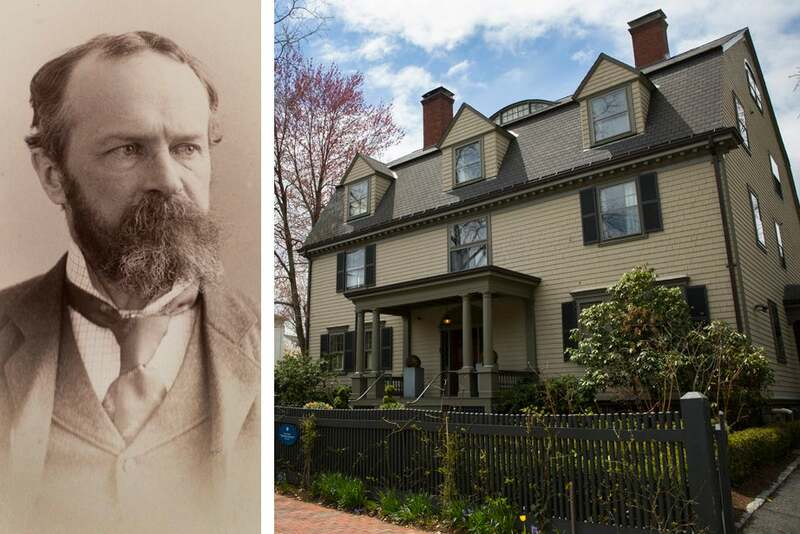 In the midst of a neighborhood of groomed yards and groomed occupants like James and Harvard philosopher Josiah Royce, the Cummings’ house represented a touch of the nature-love and joyful anarchy that the poet later displayed on the page. The triangular yard was a riot of playthings — sandbox, swings, tree house — to which the neighborhood children had free entry. The everyday hubbub included a handyman named Sandy, a dog named Hamlet, a house full of books, and nearby Norton’s Woods. She had a far-flung, adventurous early life. In 1929, Schlesinger accompanied her novelist mother, Cornelia James Cannon, three sisters, and an aunt on a three-month car trip in Europe, where she still remembers being served salted almonds by Alice B. Toklas. (Her mother and Toklas’ partner, author Gertrude Stein, both had studied with William James at Radcliffe College.) After graduating from Radcliffe herself in 1934, Marion traveled for a year in China to study painting, an experience reflected in her magical artwork. “I’m known for my horses,” she allows. Nothing much has changed. “I tell people we kept it historically accurate,” said her son, writer Andrew Schlesinger ’70, who lives with her. Schlesinger pointed to the couch where President-elect John F. Kennedy sat in January 1961 to meet with future advisers, including Arthur. She remembers JFK charging up the stairs to take a phone call in her sewing room. Julia Child (1912-2004) was a California-born champion of French cookery, the first celebrated television chef, and a woman who, incidentally, could never see the point of dining rooms. 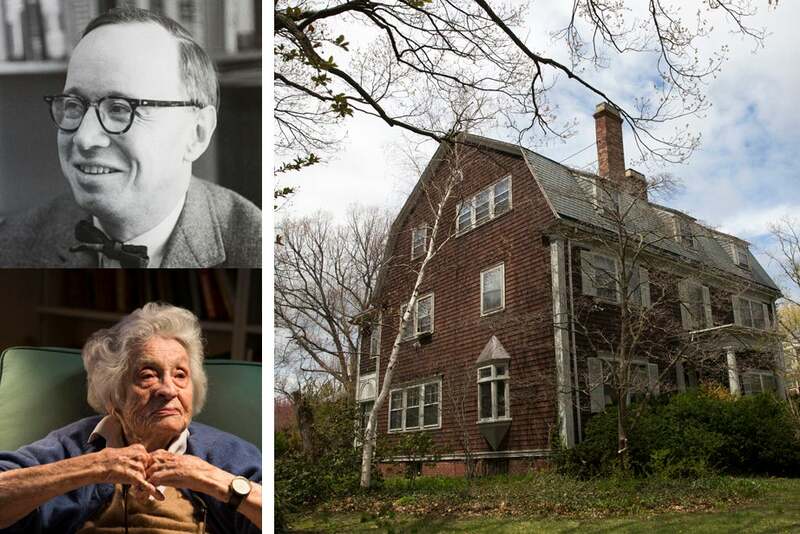 She and her husband, diplomat Paul Child, moved into 103 Irving St., the former Royce household, in the summer of 1961. They had first seen the house in 1958, just before a diplomatic posting (their last) to Oslo, Norway. “It spoke to us the moment we walked in the door,” she wrote. It was the 17th and last kitchen the couple designed. “We intended to make it both practical and beautiful,” she wrote, “a working laboratory as well as a living and dining room.” It included a gas stove scaled for a restaurant and a set of wall ovens. The countertops, designed by Paul, were 38 inches high, 2 inches above standard to accommodate Julia’s height (6 feet, 2 inches). 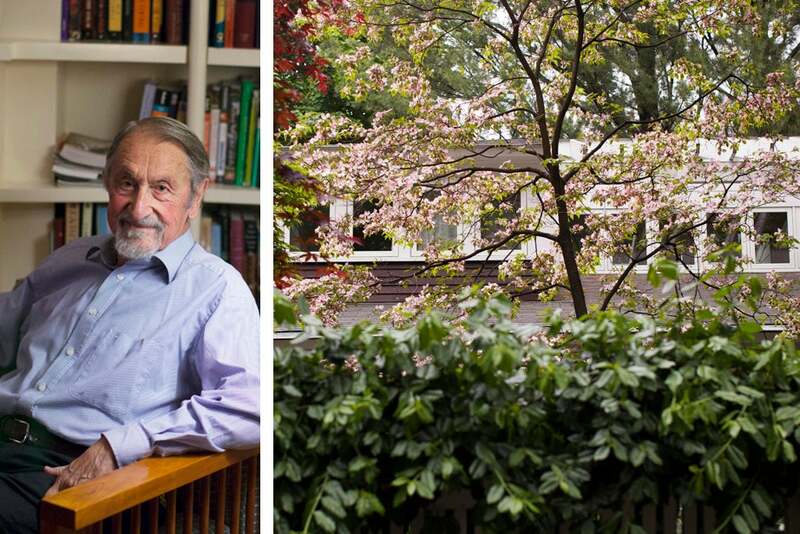 A beloved dwelling, wrote French philosopher Gaston Bachelard, is “Egg, nest, house, country, universe.” That feeling of peace and completeness is evident in the house on Irving Street that 86-year-old Martin Karplus, winner of the 2013 Nobel Prize in chemistry, shares with his wife, Marci. There is a 6-foot fence out front, lush with clinging ivy that encloses the house. 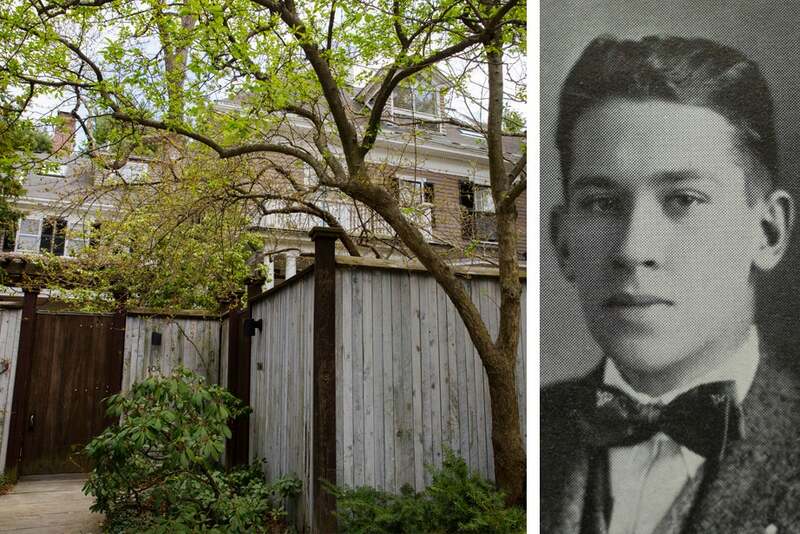 The fence is so high, said Martin, that in the past only their tallest neighbors ever appeared above it as they walked by: Child and Galbraith. “It’s a very interesting neighborhood,” said Martin, acknowledging his accomplished neighbors, present and past. He and Marci bought the ranch-style house in 1983, after hearing about it before a “for sale” sign went up. Martin does much of his work in the dining room, next to French doors that frame a compact backyard lined with old trees. It looks like a miniature forest from a fairy tale. In daytime, light floods the interior. “I like to work surrounded by light and greenery,” said Martin. As a boy, he and his family escaped Nazi rule. They lost their house in Vienna. 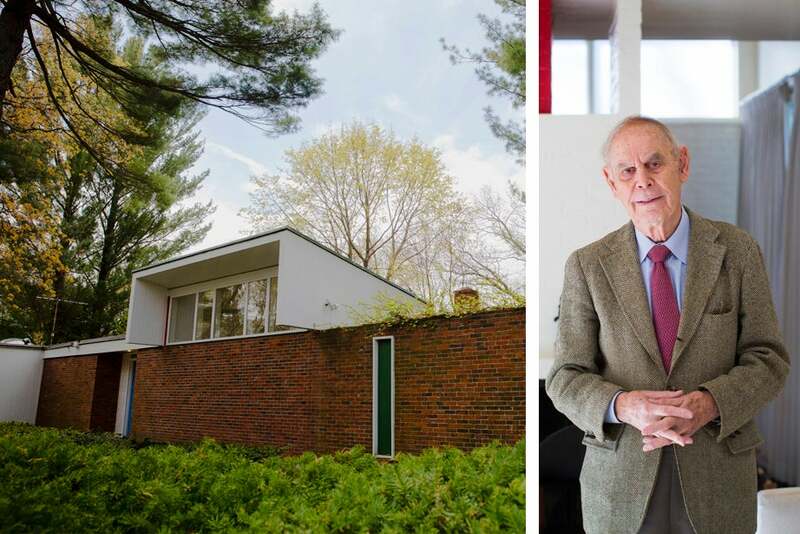 The Holtons bought a house on the end of Irving Street that is an architectural treasure: the self-designed home of Spanish architect Josep Lluís Sert (1902-1983). It is the only modernist, or even modern, house on the street. The Holtons were guests there many times after Sert took up residence in 1958. Now they call the iconic house their own, with its light-filled rectangle of rooms and its three courtyards, all based on architecture’s “golden ratio” of proportionality. Jane Brown and her son Harry Stone will both receive degrees at this year's Commencement. “It’s funny how our paths have kind of become intertwined,” Stone said.